Thank you so much for making our home look so beautiful. We really appreciate all the hard work you have put in to this project over the last few weeks. It has been a pleasure having you in our home. 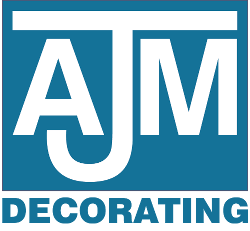 We engaged AJM Decorating to repaint the ground floor, hall and stairs of our house. The work was done to a very high standard, on time and on budget. I would not hesitate to use AJM Decorating again. Hi Ashley, Just wanted to thank you for doing such an amazing job in super time! I would definitely recommend you, very high quality and excellent attention to detail. Nothing was too much for you! Trustworthy and friendly guy! You will always be our first choice! I first used Ashley to decorate our whole house to help us sell it back in 2010, and what I liked about him from the very start is that he found the cheapest way for me to do it. I’ll never forget that he said there is no point spending too much money on the project – I’ve never heard a tradesman say that to me before!! We then moved and we used Ashley to paint our entire house over 18 months as we revamped it. He even worked the weekend before Xmas to get our daughter’s bedroom ready in time for Santa!! He is so good at his job and is a pleasure to have around, always tidy and I trust him implicitly. I have recommended Ashley to my family and friends, which is a sign of how good he is. Mr Ashley Morgan, is an outstanding painter and decorator with an exemplary work ethic. Ashley painted the whole of our House after we had recently moved in and we were absolutely ecstatic with the job. It was perfect and he is very professional, the job was so neat and every colour was as we expected. All of our new furniture was covered whilst he painted and he hoovered up after too! It was a pleasure to work with Ashley- I have recommended him already to many people and can't sing his praises enough. I highly recommend Ashley - he recently did some work in my house and I was very pleased with the level of service. He was punctual and showed up on time everyday, and took great pride in his work and showed attention to detail. Ashley was also very accommodating and managed to schedule in the work in a short space of time, getting back to us quickly with dates and quotes. I have no hesitation in recommending Ashley to friends and colleagues.